» A 1001 MIDNIGHTS review: MERLE CONSTINER – Hearse of a Different Color. 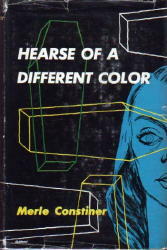 A 1001 MIDNIGHTS review: MERLE CONSTINER – Hearse of a Different Color. MERLE CONSTINER – Hearse of a Different Color. Phoenix Press, hardcover, 1952. Previously serialized in Short Stories magazine as “Death on a Party Line”: July 10, July 25, August 10, Aug 25, 1946. In Gun in Cheek (1982), the undersigned reviewer’s humorous study of classically bad crime fiction, an entire chapter is devoted to the lending-library publisher, Phoenix Press. During the Thirties and Forties, Phoenix foisted upon an unsuspecting public some of the most godawful mysteries ever penned � scores of them, in fact. Not all Phoenix mysteries were horrendous, however; every now and then, whether by accident or otherwise, a pretty good one seems to have slipped out. Hearse of a Different Color falls into that rarefied category. Shortly after Saxby’s arrival, at least part of that terrible crime is revealed: He finds Alicia dead of poison that mayor may not have been meant for her. Saxby’s investigation involves him with, among other colorful characters, a tough old lady named Cora Bob Wilkerson; the founder of the Caudry Burial Brotherhood; the owner of an abandoned sawmill (in the vicinity of which are all sorts of strange goings-on); and a dog with the magnificent moniker of Moonrise Blizzard the Second. More homicide � and the local sheriff, Masters � plagues Saxby before he finally arrives at a well-clued solution. You should not get the impression that this is a masterpiece, however; Hearse of Another Color has its flaws (one of them being the title), and in places the story shows its pulp origins (it was originally published as a serial in Short Stories in 1946). Still, the unusual background is well depicted (Constiner was a native of southern Ohio and traveled extensively in the Deep South), the plotting is competent, and the writing is above average. Come to think of it, considering the general run of Phoenix mysteries, maybe this is a masterpiece � Phoenix’s, anyway. [COMMENTS] (1) A working bibliography for Merle Constiner by Peter Ruber can be found online at the Pulp Rack website. (2) Covers for almost all of the Phoenix Press covers can be found online here, beginning with those published in 1936. Merle Constiner is one of the better pulp writers of the 1940’s. His “Dean” series in Dime Detective ran for 19 novelets, all around the 20,000 word mark. They have been reprinted in one volume by Battered Silicon Dispatch. Another excellent series ran in Black Mask, also in the 1940’s, starring southern private eye, Luther McGavock. These stories are also very long and quite well done. It is still possible to buy 1940’s issues of Black Mask and Dime Detective for reasonable prices. After his pulp writing days, beginning in the late 1950s, Constiner turned almost exclusively to writing westerns, particularly as halves of Ace Doubles. I’ve been told that even as westerns, his books always had a strong component of mystery fiction in them. And some of them were very good. Short-Trigger Man (1964) is one of the best Western paperbacks I’ve read.